IntendBeDo (Intend...Be...Do) Set, Align, Track and Realize your Intentions in areas you are passionate about while being on purpose. Be part of a community where we help each other Set, Align, Track and Realize our Intentions. It is a know fact that you are more present while Doing. While Doing you also know that your Intention is happening because you are committed and moving forward. It is also important to note that learning to Be Present other than while Doing will help you take your Inentions to a whole other level. Here at IntendBeDo we are building a community where we create the lives we want and in the process help others do the same. This web application will help you Set, Align, Track and Realize your Intentions. When Setting an Intention it is critical that you write it in the present moment as an action. In other words, as if you are doing it now and not something you will get to in the future. It is also critical that you Align your Intentions so that you create leverage Align your Intentions so that you create leverage instead of a clash. If you have two Intentions that are competing directly for time, as an example, then you reduce your effectiveness of Realizing your Intentions. Track your intentions so that you create a focus around your intentions and where you can watch your developments. This web application helps us evolve our Intentions. It is unbelievable how much we forget about what we already learned about a specific Intention. Now you just have to log in and see what you learned in the past and evlove it. It is truly amazing what you can accomplish using this simple system. There are a number of major intentions that are common to everyone as follows: Health, Career, Finances, Home, Car, Social Network, Relationships, Hobbies and Personal Development. According to Eckhart Tolle our inner purpose is the same for everyone (to be present so consciousness can awaken through us). Our outer purpose is unique to each of us. If our inner and outer purpose is in alignment then we will be flooded with intuitive feelings resulting in insight. Even if you are not sure what your outer purpose is you probably have a few ideas. What ever purpose you choose it will inevitably lead you to find an outer purpose that is more in alignment with your inner purpose as you go forward. This site is for first timers and also for those of you who have experienced positive results in self-improvement and who want more. Einstein said - "The intuitive mind is a sacred gift and the rational mind is a faithful servant. We have created a society that honors the servant and has forgotten the gift." Lets collaborate and help each other become more Intuitive so we can receive Insights that will help us all realize our Intentions beyond our wildest dreams. In this web application you can clearly Set, Align, Track and Realize your In this web application you can clearly Set, Align, Track and Realize your Intentions in a private secure setting. You can share your Intentions with others if you choose. In addition you can add specific activity summaries to your Intentions allowing you to visually track your progress with graphs. You can tweak your Intentions as often as you want. The more often you tweak, the clearer your Intentions become and the closer they are to realization. By purchasing any of the books or products on this web site you are helping to support IntendBeDo's purpose - To help and live our Purpose. Thank you and we look forward to evolving with you. 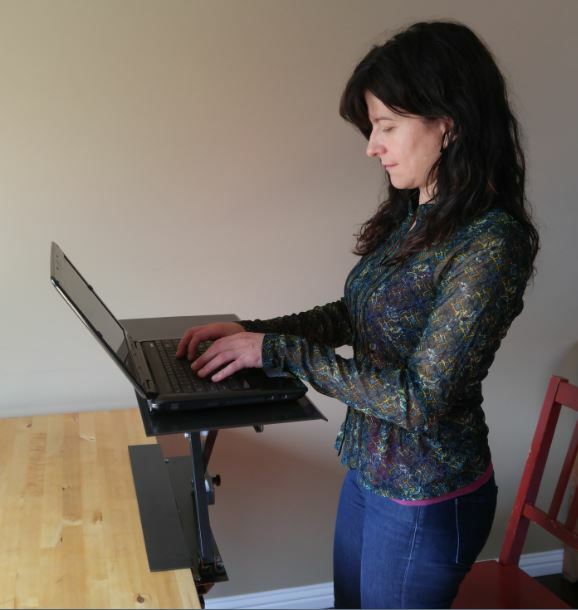 The Portable SitOrStand100 is designed for people on the move with their laptops, tablets or as a lectern. Allows you to sit or stand instantly. It can also be used with a keyboard and a riser for extra ergonomic benefits.